(December 19, 2014 by Laura Paisley　University of Southern California News) With apologies to the National Football League, baseball is still recognized as our national sport. Internationally, however, the bases aren’t fully loaded. That became clear in 2005, when the International Olympic Committee dropped baseball from the 2012 Olympic program. Major League Baseball’s appeal of the decision was denied the following year. Now Bob Oettinger ’73 is working to move baseball from benchwarmer to batter up. In 2009, the lifelong baseball fan got together with a few businessmen, including lawyer Joseph Ryan and former major league players Reggie Smith, Dave Stewart and Brad Lesley. 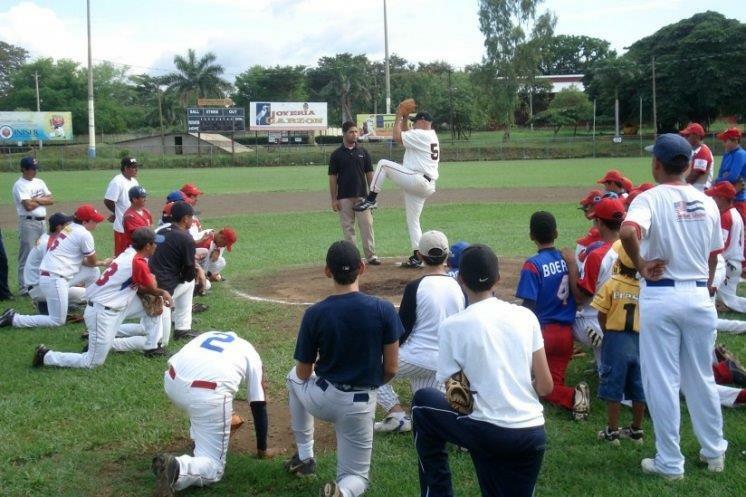 The group formed the International Baseball Association (IBA) with the mission of promoting baseball around the world by establishing baseball academies to train and educate young players. Oettinger, who serves as IBA president, and the cohort decided on Central America as the starting point. After meeting with MLB executives to discuss their ambitions, the group was advised to visit the Dominican Republic and study how its numerous major league academies are structured. Lights … cameras … reporters! In all of Central America, two countries call baseball their national sport: Nicaragua and Panama (it is said that the countries once had American military stationed there that introduced the game). In Nicaragua, still recovering from the Sandinista Revolution and regime of the 1980s, economic and industrial development has been slow. There was next to nothing in terms of formalized baseball infrastructure, Oettinger said. In March 2010, Oettinger and IBA partner Ryan flew to Nicaragua on a fact-finding mission. “We were really overwhelmed at the reception we got,” he recalled. “Everyone was so enthusiastic, and there is a real national pride for baseball down there. To my amazement, we entered a room with at least 25 media members and TV cameras. Pretty heady — and intimidating. The reporters’ questions made it clear that Nicaragua was excited and eager to welcome the IBA. The enthusiasm sealed the deal for Oettinger. Since that initial visit, he has been to Nicaragua 18 times. From the start, Oettinger realized Nicaragua needed plenty of help with the sport’s organization and infrastructure. There were various small, independent leagues in many different towns, but facilities were almost nonexistent. Often, children played in fields, literally nudging cows aside, and made baseballs from rolled-up socks bound with tape. Over the past few years, the IBA has collaborated with schools and other organizations to distribute more than three tons of donated baseball equipment to youth teams in Nicaragua. It has also coordinated baseball clinics for players and coaches around the country, geared to improve the quality of coaching and afford IBA an opportunity to scout talent. Now the IBA is formalizing a partnership with Managua’s Boer Indios, one of four teams in the Nicaraguan Professional Baseball League. They will collaborate on implementing a training program for a select number of young players, with the longer-term goal of constructing an academy. With a board of directors in place and fundraising underway, the future academy will provide intensive training in baseball fundamentals in addition to seminars in sports medicine, nutrition, coaching and umpire training. Participants will also receive classroom instruction in computers, math, English-language and business skills. While the IBA aims to help young players obtain scholarships to U.S. universities or move into careers in pro baseball, it is also committed to improving the lifestyles of the young people who do not continue in baseball. We’re focusing on kids 14 to 16 years old, many of whom have already dropped out of school. The program also teaches participants valuable skills applicable in the growing tourism industry of Nicaragua. This helps to raise the standard of living of the players as well as the surrounding community. Some staff will be hired from the local labor force, with an emphasis on providing vocational education. Oettinger has worked in corporate and nonprofit management, fundraising, planning, public relations and promotions for more than 25 years. At USC Dornsife, Oettinger majored in history and worked as a student assistant in USC’s sports information department. He also served as a reporter and eventually director of a student news bureau sponsored by the USC Annenberg School for Communication and Journalism and took many public relations classes. A growing number of young Nicaraguan athletes are getting to the American minor leagues, he said. For the 2014 season, there are three Nicaraguan players in the major leagues.